Position encoders are used to track the rotary position of a shaft or linear position of a load either indirectly with a motor mounted rotary encoder or directly with linear encoders. As always, the selection process involves trade-offs. The most effective implementation depends upon the setup, the conditions, and the performance requirements of the application. This approach offers moderate performance but is straightforward to use. A rotary position encoder is installed on the shaft of a rotary motor to monitor shaft position. The position encoder provides an output corresponding to the rotation of the shaft, either in terms of voltage pulses when using incremental encoders or absolute angular position when using absolute encoders. The readout device, whether it is a controller, drive, or counter/display, needs to convert this data into the length of travel, then add this length of travel to the initial position to determine the final position. The decision of whether to use an incremental or absolute position encoder should be driven by the application. For example, it is absolutely necessary for surgical robots to know its position when starting up, especially after a fault while performing surgery. In other cases, re-homing at startup is not a problem. This configuration is easy to install and reliable. It supports direct feedback to the motor. Because the position encoder is not directly connected to the load, however, this method offers only limited accuracy. Error sources include couplers; shaft-to-shaft misalignment; gearbox backlash; and non-linearities introduced by accelerations, temperature variations, etc. In applications requiring a reversal of direction, hysteresis can be a problem, particularly when there is a significant amount of compliance in the system. 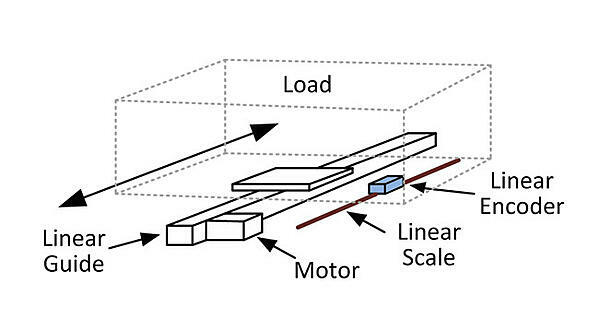 Monitoring the motion of a load on a linear motor using a linear position encoder delivers much better accuracy. A linear motor is essentially a rotary motor unwound, so it generates linear motion directly. There is no need for a mechanical actuator. This eliminates several error sources. To measure the position of the load on a linear motor using a linear encoder, the linear scale needs to be affixed to the stationary part of the motor, typically the magnet track or the surface supporting it. 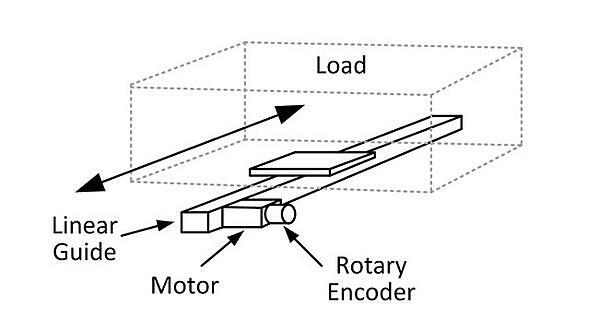 The readout element of the encoder is mounted on the moving part of the motor, known as the forcer. Once again, both incremental and absolute position encoders can be used. In each case, they provide the readout device with a measure of displacement that can be used to calculate the position of the load. An example of an indirect rotary encoder method is to use a draw string encoder. This is common in hydraulic cylinders. This method provides better position accuracy than the rotary version. It must be used in an appropriate environment, however. The scale needs to be kept clean and in good condition. It needs to be properly mounted so that it is well aligned. Since these are both requirements for linear motors, however, these conditions are typically easy to meet. Frequently, although not always, the load of a linear motor rides on a carriage attached to the moving portion of the motor. In cases like these, the system described above becomes equivalent to the third approach, which is direct readout of position using a linear encoder or another sensor. Applications requiring very high accuracy should use linear encoders mounted on the load. This direct-read method greatly reduces measurement error. It can be used with both linear motors and rotary motors driving linear actuators. In this approach, the linear position encoder should be mounted external to the linear motor/linear actuator. As described above, the scale of the linear encoder should be mounted to a non-moving surface and the detector assembly should be affixed to the load. Particularly in the case of a ball screw actuator, mounting the encoder on the load removes much of the error in the system. At this point, the encoder becomes the primary error source for position location. Given that encoders typically outperform most system components, the direct approach makes it easy to achieve the accuracy and repeatability necessary for the application. The technique is compatible with either incremental or absolute encoders. 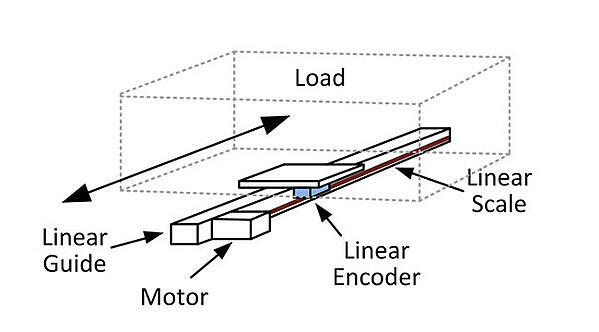 Incremental encoders can be used with interpolation techniques for very high-resolution while absolute versions have the advantage of reading out the position of the load directly. One example of a very high resolution device that has been employed in the configuration a laser interferometer. The trade-off for all that accuracy is significantly greater challenge in the implementation. The approach increases cost and complexity while adding additional points of failure resulting in a reduction in overall system reliability. As with the previous example, the system is more vulnerable to contamination. Particularly in the case of very high-performance sensors, this must be considered.